To be clear, I don’t have a problem with seasonal gift guide posts on blogs. It’s relatively easy and fun to put together, and there are plenty out there with a productivity theme that are helpful every year. You’ll find a lot of similar products and services mentioned on all of them, many of which probably would have been on my list as well like favorite notebooks, inspirational reading, and office accessories. And as much as I would like get philosophical and say that real productivity isn’t something you can wrap in a box with a bow on it (how awesome that would be if you could though? Can someone get on that please?) there are things we can give that help create an environment for more productive habits. This is just what it says it is: a timer in the shape of a 2-inch cube. There are no buttons except an on/off switch, and it’s preset with four alarm intervals of 5, 15, 30, or 60 minutes. Using it is effortless – just flip the cube so the interval time you want is facing up and the timer will automatically start counting down the minutes. When it beeps at the end you just flip it back so the zero is facing up and it’s instantly reset to use again. This is easily my favorite secret weapon of office accessories, and a tool I’ve come to rely on more and more because it is so uncomplicated and freaking simple to use. Since it’s basically frictionless to operate, you can set and reset it with one hand at barely a glance. Full disclosure: the one I have and use in my office is one of the original Japanese versions with slightly different settings of 3, 10, 30, and 60 minutes. (Why three minutes? For all those Cup Noodles you’re eating at your desk, of course). But I’m recommending the model linked in the photo because it’s got intervals most of us are used to, including two key intervals I use most: 30 minutes and 60 minutes. I often find it even more helpful to combine long and short intervals that create a structure and discipline for large tasks I’ve been avoiding (15 minutes of work, 5 minutes of Twitter, 15 minutes of work, 5 minutes for a coffee break, 15 minutes of work, 5 minutes of drawing, etc.) Anyone who has tried the Pomodoro Technique will find this familiar. Merlin Mann has also written great stuff about this in the past. Whatever it is you need to do, setting limits gives you a tangible short-term goal to help you get work done, and the Cubic Timer is my favorite tool for the job. Here’s hoping someone wraps a box of productivity for you this holiday season. It really is a gift that keeps on giving. I’m going to keep on giving too, with my “One Hundred Percent Human” newsletter from TinyLetter. Each edition will feature monthly re-caps from this blog focusing on productivity and habits at work, as well as occasional newsletter-only content whenever the mood strikes me. 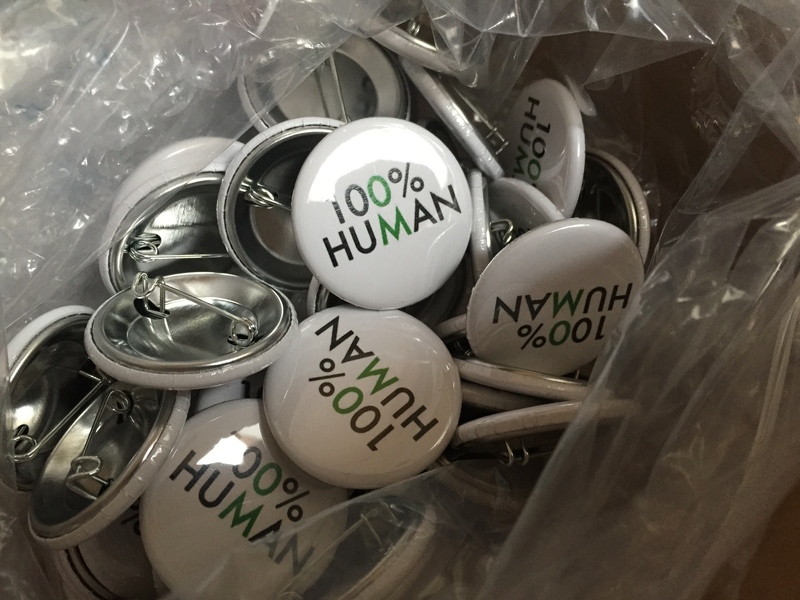 Subscribe today to see my bonus newsletter-only Holiday Gift suggestion, plus I’m sending my first 25 TinyLetter subscribers an exclusive 100% Human button because I like to give out free stuff. I also would love your feedback, so leave a comment below or email me if there’s anything on your mind. I’m always here for my fellow #humans. Got my timer in the mail this weekend and taking it for a spin today! I love the blog. Keep it up!